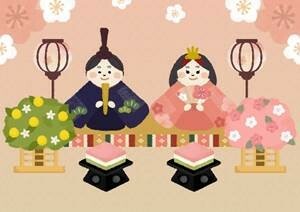 “Hina-matsuri(the Doll’s Festival)” is held on March 3rd. 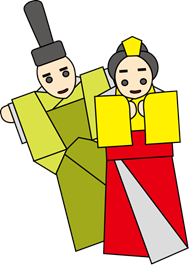 It’s also called “the Girls’ Festival” and it’s annual event of the seasonal festival to pray for the healthy growth of girls. It’s also known as the Peach Festival. 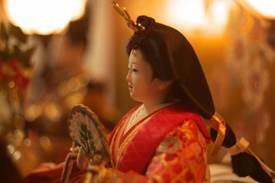 People began displaying dolls in the Edo period. 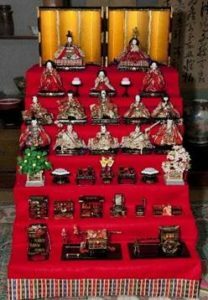 People display graceful dolls in ancient court costumes on a tier of 5 or 7 shelves covered with scarlet cloth. These dolls represent the Emperor (odairi-sama), the Empress (ohina-sama), three court ladies (sannin-kanjo), five court musicians (gonin-bayashi), the minister of the left (sadaijin), the minister of the right (udaijin) and three servants (sannin-jougo). Young girls wear their beautiful Kimono and get together before the display and have a good time. 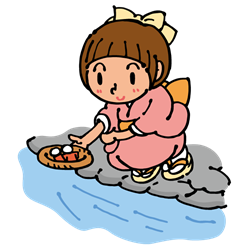 Today, we eat traditional dishes like Scattered sushi(chirashi-sushi), clam soup, sweet white sake(shirozake), rise cake cubes (hina-arare) and diamond-shaped rice cakes(hishimochi) for the Doll’s Festival. 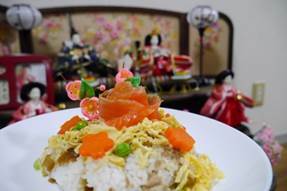 The ingredients of the sushi are casually scattered and layered on top of the rice. There is no fixed recipe and you don’t need to use raw fish either if you don’t like, but you can add any ingredient you prefer. Making a perfectly shaped or rolled sushi can be difficult, but it is very easy to make scattered sushi as doesn’t require any particular ability. Shirozake refers to a sake served to celebrate the Hina-matsuri. Hina-arare is a kind of Japanese snack made from rice that is offered at the Hina-matsuri. 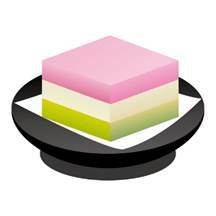 Hishiochi is the rice cake of diamond which is put on a doll-displaying stand during the Hina-matsuri. Copyright© やじべえの気になる○○ , 2016 All Rights Reserved.